Good Monday afternoon! We’ve had a little rain across parts of Alabama this morning, but the rain has faded away this afternoon. I don’t expect any additional rain chances through Wednesday, as a surface high pressure creeps into the area. With a wet ground, a fairly moist airmass and calm winds over Alabama, there’s a good chance we’ll have some fog late tonight and early Tuesday morning. At this point, it looks like foggy conditions will be patchy and not widespread. Temperatures are cooler this evening, due to some clouds and rain today, so expect a very pleasant evening. We’ll fall into the upper 60s after 8pm and lower 60s after midnight tonight. Skies will gradually become mostly clear overnight. We’ll be stuck between a surface high and a plum of tropical moisture for much of the week. It sure looks like the high pressure will win the battle and keep our area mostly dry through Friday, but a lone shower or two will become possible any day this week. Also, expect a mixture of clouds and sun. Lows at night will fall into the lower or middle 60s each night this week, with daytime highs in the lower to middle 80s. Out in the tropics… We’ve got a new tropical storm in the central Atlantic. Jerry formed officially at 11am this morning, with winds of 40mph. This system is moving east and will not impact the US… There’s another system in the Caribbean we’re watching, but it’s unlikely that it becomes anything other than a rain maker. At most, it could become a weak tropical storm, but we have a little time to watch it. Clouds sure increased fast today and it helped temperature stay in the mid/upper 70s across west Alabama, but the rain held off so it actually felt nice outside even with the overcast sky conditions. As the approaching frontal boundary continues to lose its identity, I’m not expecting a lot of rain activity tomorrow, but some showers in scattered spots are certainly possible. I am, however, expecting similar sky conditions with lots of cloud cover and temperatures remaining in the upper 70s. We remain in a southeasterly flow at the surface for much of the upcoming work week, but moisture will be slow to increase. Still, as the air heats up during the afternoon, an isolated shower or two is certainly possible Tuesday. A weak upper-level disturbance evolves over the Lower Mississippi River Valley by Wednesday, and this may act to give us a little bit higher rain coverage over far western Alabama, but I think the higher rain chances should remain along the Mississippi River. We’ll see temperatures remain in the mid 80s through Friday, but some big time changes look to be on the horizon. By the weekend, models continue to suggest a strong trough moving across the country. This will likely bring with it higher rain chances as well as some thunderstorms to the area at some point this weekend from Friday night through Sunday morning. I say that broad timeframe because models are still having a tough time resolving the time scale and specific intensity. Still, we can expect an increase in showers and storms most likely for your Saturday, before some much cooler air filters in behind this system. We could be seeing highs in the 70s and lows well down in the 50s if models are correct and that cooler airmass is able to make its way down towards our area…time will tell, stay tuned! We enjoyed the effects of high pressure today – tons of sunshine and comfortable temperatures in the low 80s with low humidity. I hope everyone could enjoy this weather today! We do have some changes on the way, however. We’ll see that high pressure slide off to our east, and a southeasterly flow will result for tomorrow. This will help increase our moisture content gradually, but mid-level moisture will also be on the increase as well. What this means is, we’ll have sunshine to start your Sunday, but mid-level clouds will quickly increase throughout the afternoon. We could see a few showers tomorrow night, but most model guidance suggests the rain showers accompanying an approaching front will dissipate. Furthermore, this front will kind of become diffuse as upper-level energy lifts off to the northeast. We’ll see moisture remain in place throughout the upcoming work week, but with a flat upper flow. What this translates to weather wise is this: a partly cloudy sky with a few spot showers possible for Monday and Tuesday. By the middle of the week, mid-level high pressure will settle into the western Atlantic. The GFS and Euro suggest a weak piece of energy or two will ride northeast on the western periphery of this ridge. This may spell a little higher rain chances for Wednesday and Thursday but still, a widespread rain even is not likely. Models continue to suggest a much stronger system by the weekend. It is still way too early to be specific on this, but I would look for increasing rain chances at some point Friday afternoon through Sunday morning. We’ll hopefully have better timing for you as the week goes along. Enjoy your Saturday night, and Roll Tide!!!! Good Friday afternoon! Our weather has turned out great this afternoon, with temperatures in the lower to middle 80s across Alabama. Skies are mostly sunny and will remain clear to mostly clear during the overnight hours tonight. If you have plans outdoors or are going to a local high school football game, expect great weather. Temperatures will fall into the upper 70s after 7pm, then upper 60s around 10pm. Lows will reach the upper 50s across much of Alabama tonight. As a surface high remains in control of our weather through the weekend, I don’t expect many weather changes. Highs will remain in the middle 80s, under a mostly sunny skies. Due to dry air and clear skies, temperatures will cool quickly during the overnight hours, with most areas in the upper 50s at night over the weekend. Alabama takes on Ole Miss on Saturday, at Bryant-Denny Stadium. Look for a great gameday forecast, with a good supply of sun all day and clear skies that night. Temperatures will top out in the middle to upper 80s on Saturday, with temperatures falling into the upper 70s at gametime. Kickoff is at 5:30pm in Tuscaloosa… Look for temperatures in the lower 70s at the end of the game at Bryant-Denny. Good Thursday afternoon! After a rather cloudy start to the day, our weather has turned out nearly perfect this afternoon. Most of Alabama is reporting temperatures in the lower 80s, due to the limited heating to start off the day. Skies will remain mostly clear tonight, with temperatures falling into the lower 60s. As the air over Alabama continues to dry out, you’ll notice big temperature differences between lows and highs. Dry air heats and cools very efficiently. This evening, temperatures will fall into the upper 70s by 10pm and upper 60s at 10pm. Look for a clear sky overnight, with some patchy fog late tonight. Friday through Sunday will feature really nice weather. Highs will top out in the middle to upper 80s, with lows in the upper 50s to lower 60s. There is no risk of rain through Sunday, as a surface high moves over the area. 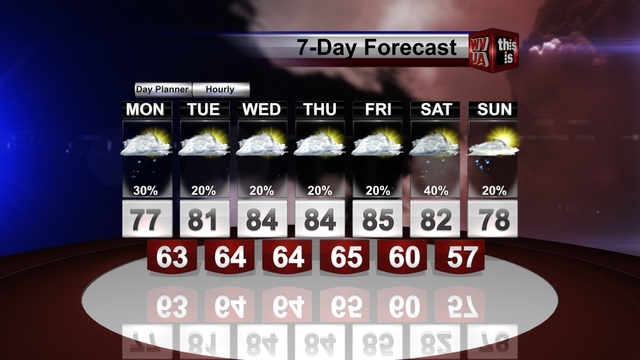 Humid weather will gradually increase early next week, with the chance of a lone shower or storm each afternoon. Highs will continue in the lower to middle 80s early next week, with lows in the lower 60s. Good Wednesday afternoon! Our local weather has turned out very nice this afternoon, as sunshine returned to the area. Temperatures have warmed into the middle 80s across west Alabama, while east Alabama is mostly in the 70s. Extra clouds and a few showers have kept areas near and east of I-65 a tad cooler. With lots of low level moisture in place this evening, expect fog to develop tonight and early Thursday morning. Fog could become pretty widespread, so use caution if you’re going to be driving tonight or early Thursday. The weather is looking great during the day on Thursday, as fog quickly evaporates. Skies will remain sunny on Thursday, Friday and Saturday, as a surface high moves into the area. The surface high will keep our area really quiet and dry. Highs will top out in the middle to upper 80s, with lows in the lower 60s. A few upper 50s are possible northeast of Fayette and Birmingham Thursday night through Sunday night. Our next system to watch moves in late Sunday and on Monday. At this point, there’s not a very high risk of rain due to dry air in place. A few scattered showers or storms are possible late Sunday and on Monday. Your weekend plans should remain completely dry. Football Friday is looking fantastic, with temperatures in the upper 70s at the 7pm kickoff and upper 60s to end the games around 10pm. Skies will remain clear through the entire high school football games around west and central Alabama.